A common theme among parents through history has been the desire to make the next generation better than the one before. In other words, we want to equip our kids with the knowledge and the skills to thrive where we may have merely survived. In this day and age of conservation consciousness, what better way to teach your kids about the concepts of saving money and energy than by imparting a skill that they can keep with them forever? 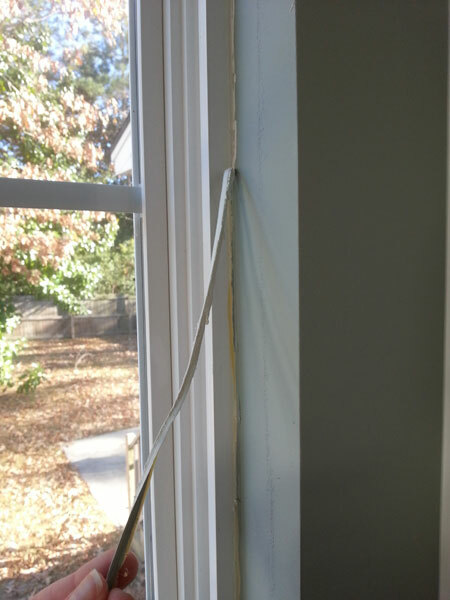 Going through the process of re-caulking your windows will do just that…and improve your property while you’re at it! 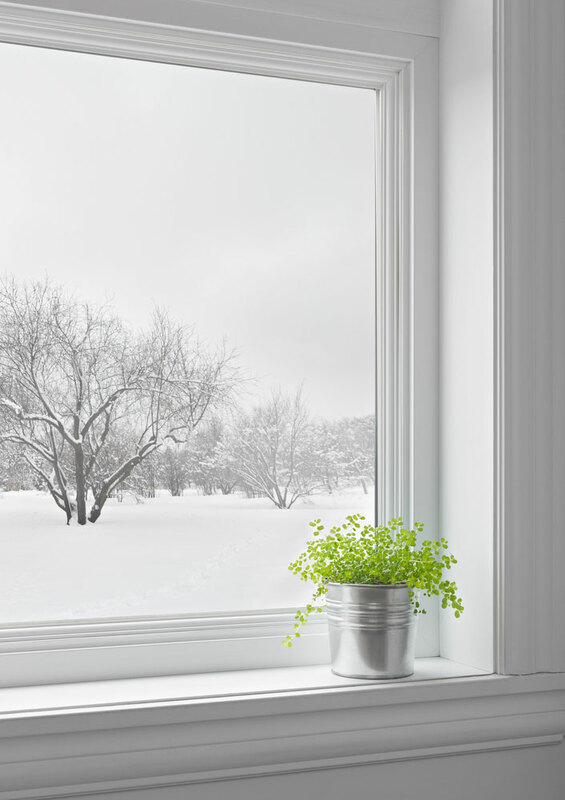 Here’s how you can enhance your child’s awareness of the importance of conservation and winterize your windows in a single weekend. A bit of backstory: My husband and I recently purchased our first home and after over 6 months of DIY renovation projects, reviving the windows are one of the last ‘big’ endeavors on the list. Although our home is only 10 years old, it hadn’t been ‘properly’ touched since it was built and the windows are one of the biggest indicators of a decade of neglect. 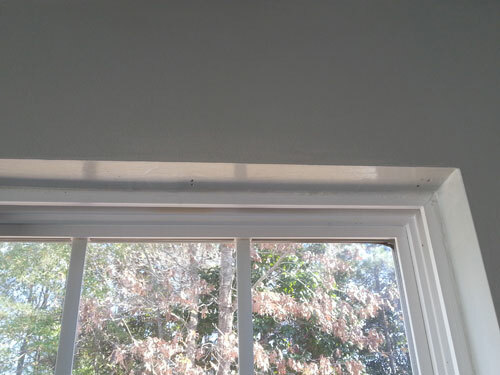 As you can see, several rounds of room painting have resulted in caked-on paint in a multitude of unfortunate colors smeared all around the window casement and caulk has been layered on top of itself so many times, it is literally peeling off on its own. For safety purposes, mom and dad should be in charge of the caulk cutting with the utility knife. 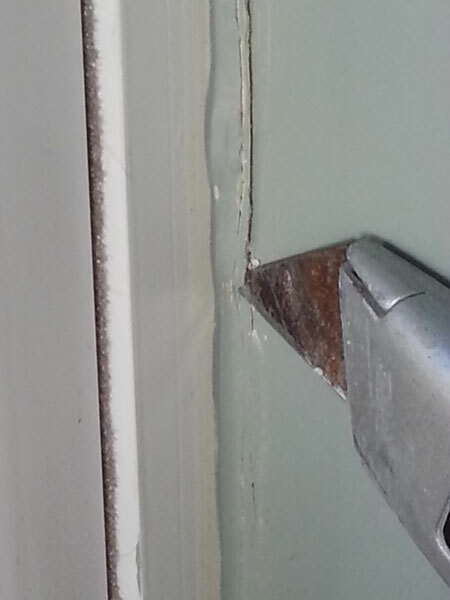 Locate the outer edge of the old caulking and carefully slide the knife along the window frame to loosen the caulk. Do the same on the side closest to the window pane. Avoid digging into the frame or the drywall itself; the goal is to only remove the old caulking and not damage the window. Now comes the fun part for the kids: Have them carefully pull the caulking away from the window. You can even make a game out of it: Who can create the longest strip of caulking without breaking it?! 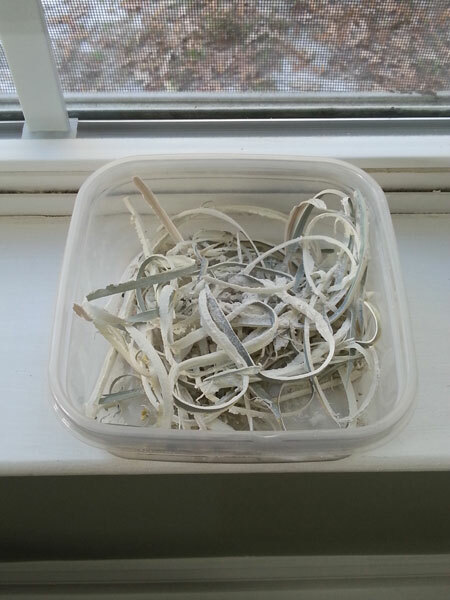 Gather together the old caulking to discard it…or create a lovely caulk spaghetti! Yuk! Once you have removed all of the old bits of caulking, wipe all of the edges around the window to ensure the surfaces are clean and dry. 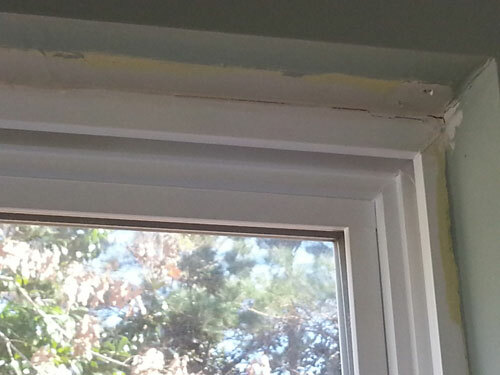 From here, cut the tip of the caulk gun at a 45° degree angle and position it against the window edge. 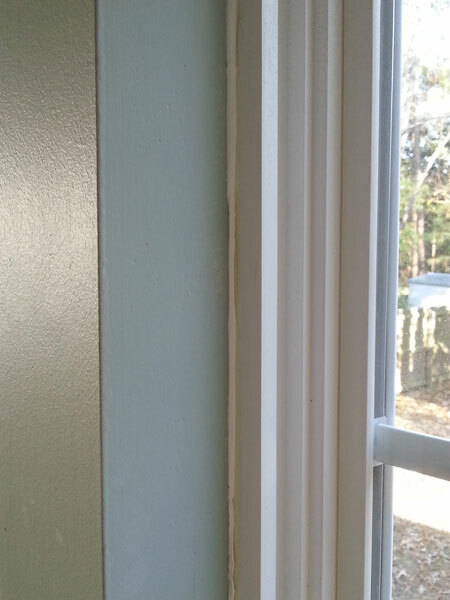 Slowly squeeze out a thin bead of caulking along the window. Less is definitely more here! 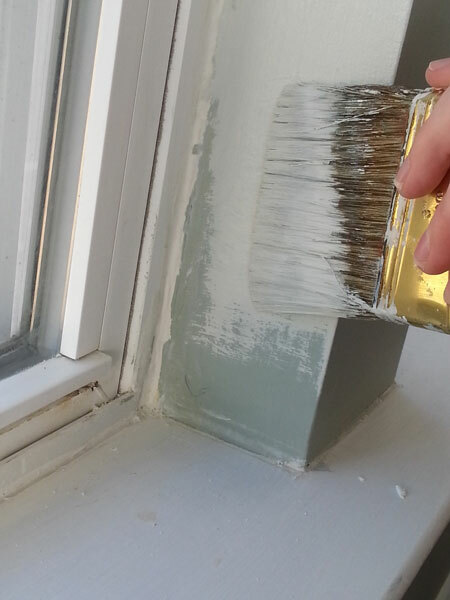 Take a wet finger and gently smoosh the bead flush into the window edge and wipe away the excess. Work quickly here as the caulk gets crumbly on the surface as it starts to dry. 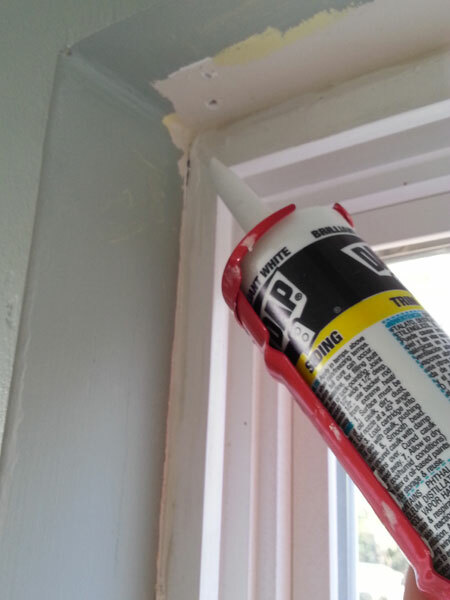 Allow the caulk to dry for at least 2 hours before moving on to the final step of painting. 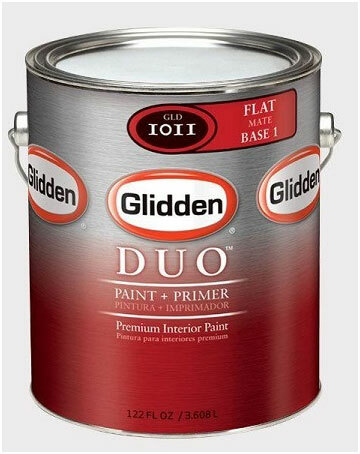 *Tip: Be sure to apply primer first or use a paint-and-primer-in-one like this selection from Glidden. Check out how much better this bottom corner looks from its earlier picture. Go ahead: we’ll wait while you scroll back up to find it! After you have painted around all sides of the window, step back and appreciate your hard work. Much better now, right? This is a perfect example of the practical skills you can teach your kids while working around the house over the weekend. It may require a bit more work than simply painting over the old caulking but it will also show them how taking the time to do something right can really pay off in the end – with a beautiful and beautifully insulated window that isn’t leaking out costly heating and cooling! What are some of the greener initiatives you and your kids have undertaken around the house? Rheney Williams loves sharing her DIY experiences with others in the hopes of encouraging them to try things that may be out of their comfort zones. Rheney writes about projects for doors and windows for The Home Depot that range from updating your existing home décor to dressing up doors and windows in fun and creative new ways.